Say Hello! — Plant-based ice cream truck wants to expand! FAQ: Say Hello! 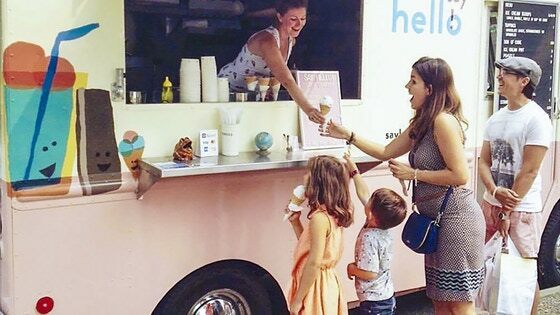 — Plant-based ice cream truck wants to expand! If it's not dairy, then what is it? The base for each flavour is unique, but I use coconut milk in all of them. If I want to reduce the coconut flavour to highlight, say, a spice or fruit, I add in a house made cashew milk. Do you offer sugar free? I currently do not offer a sugar free option, but every flavour is refined sugar free. I use a combination of organic agave syrup or maple syrup with some organic cane sugar. I want to introduce a sugar free option using xylitol, and if this campaign is successful, I will have the means to start recipe testing. Why did you choose such a silly name for Babycakes? Haha, yeah it is silly! She was just a tiny baby when I adopted her from RAPS (Richmond Animal Protection Society), but I knew she would grow to be a big dog. Sadly, because of her breed mix, I also knew some people would have preconceived misconceptions about her. So I chose a silly name to counter act that tough dog reputation. Trust me, she is a gentle giant. If it's not dairy, then what is it? Do you offer sugar free? Why did you choose such a silly name for Babycakes? I want to know when my reward is shipping. I am having trouble filling out my survey. I would like to make a change to my pledge. I would like help with preorders. I have a issue with my pledge finances. I have a question for the project creator. I have a question not listed here. I want a refund for my initial campaign pledge. I have a question about BackerKit.